Now that most of us have bid farewell to those lazy, hazy days of summer, we start to think of autumn and those cooler days ahead. For landscapers and home gardeners, this means beginning to plan how our plants and vegetation will be affected by the season’s first frost and eventual freeze, marking the end of the growing season. But what is the difference between a frost and a freeze? Frost occurs on those clear, windless nights when the air temperature stays just above freezing (usually 33-35°) but outdoor surfaces near the ground such as your car or blades of grass drop just below freezing. This allows excess moisture to freeze onto them, creating frost. On the other hand, a freeze occurs when widespread very cold, dry air moves into a large region keeping the air temperature well below 32° for a sufficient period of time, which can severely damage crops. So, when do we typically see the first freeze? Check out the map below to find out. 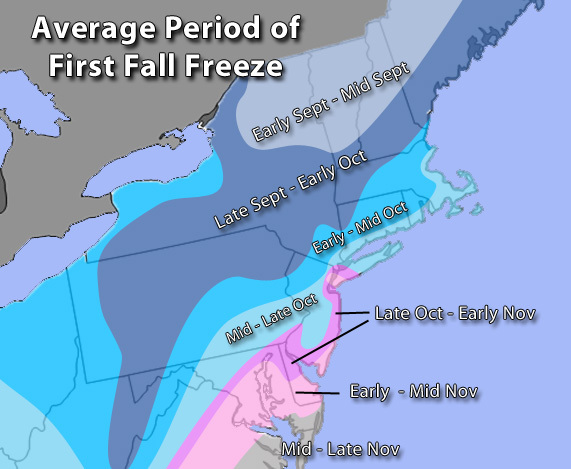 Our long range expert, Nick Troiano, has his own predictions about when the first freeze will be upon us. According to him the weather pattern as we approach the heart of fall will be highly variable. In other words, most areas across New England, the Northeast, and the Mid-Atlantic can expect to see dramatic changes in temperature from cooler than average to warmer than average in a relatively short period of time. This will make pin-pointing a specific timeframe when most areas will see their first freeze very difficult - as it will depend on exactly when and where these colder outbreaks setup. In general, however, it looks as though most places can expect to see their first bout of freezing temperatures near or slightly later than the long-term climatological normals - with the exception of Northern upstate NY and into extreme northern New England. The reason being is that the main heart of the coldest air associated with a mean trough of low pressure should set up just west, and be centered over parts of the Midwest and Great Lakes. This type of pattern is normally associated with near to slightly above average temperatures and as a result, delaying the first freeze. However, occasionally, these shots of cold air may graze the northern most parts of the Northeast, especially into the higher elevations of the Adirondacks and White Mountains.